Thank you for deciding to be part of our life-changing organization. 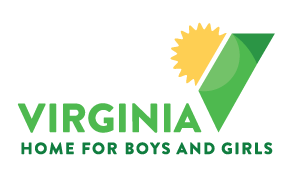 At Virginia Home for Boys and Girls, success is measured one child, one family at a time. Listen to VHBG alumna, Skye, tell her story of success. She’s joined in this video by her former VHBG Teaching-Parent, Cory Richardson-Lauve, who continues to work at VHBG as our Vice President of Programs. Program fees paid for with public dollars only cover a portion of what is needed to provide the trauma-informed care children in crisis require. With nearly 50% of VHBG’s budget supported by philanthropy and other sources of income, your gift helps make a meaningful impact in the daily lives of Virginia’s at-risk children and helps build strong families in our communities. $25-$99 – guarantees snacks for our John G. Wood School students. $100-$249 – equips new students with school supplies. $250-$499 – ensures that we have art supplies for our art program. $1,000-$2,499 – provides educational/recreational outings for kids in our group homes during the summer. $5,000-$9,999 – provides staff support ratio needed for our students to succeed in school. The VHBG Foundation Board was created in 2013 and oversees investments and works to ensure VHBG’s assets are managed in the best way to benefit the organization well into the future. Investment funds held by the VHBG Foundation do not meet the legal definition of endowment funds permanently restricted by legal definitions. The VHBG Foundation is a separate legal entity and files its own Form 990. The VHBG Foundation has a distribution policy that allows for an annual distribution of 5% of the rolling three-year average of the fair value of the investments to support operations and responsibly plan for the welfare of children and families in the future. VHBG is an approved Neighborhood Assistance Program (NAP) organization. The purpose of the NAP is to encourage businesses, trusts and individuals to make donations to approved 501(c) (3) organizations for the benefit of low-income persons. In return for their contributions, businesses, trusts, and individuals may receive tax credits equal to 65 percent of the donation that may be applied against their state income tax liability. For more information, contact Lionel Bacon, VHBG’s Vice President of Philanthropy at (804) 270-6566 x115, LBacon@vhbg.org. Please contact us or have your broker contact Lionel Bacon, VHBG’s Vice President of Philanthropy at (804) 270-6566 x115, LBacon@vhbg.org to inform us of your contribution. If you have any questions about VHBG’s Matching Gift Program, please contact Lionel Bacon, VHBG’s Vice President of Philanthropy at (804) 270-6566 x115, LBacon@vhbg.org. CSX Corporation Pepsi Bottling Co.
Leave a legacy of strength by supporting VHBG through your estate plans. Planned gifts not only provide for VHBG’s future, but they may offer current tax benefits and help reduce estate taxes. Donors who designate VHBG in their estate plans are invited to join The Legacy Society, an organization created to recognize these gifts of a lifetime. Legacy Society donors support the safety and livelihood of our children well into the future. Please contact Lionel Bacon, VHBG’s Vice President of Philanthropy at (804) 270-6566 x115, LBacon@vhbg.org to ensure that your wishes are understood. To keep Virginia Home for Boys and Girls running smoothly all year long, we rely on wish list donations. Below you will find a list of items that we are always grateful to accept from donors. Supply collection drives can be fun and a way to engage your school, neighborhood, business, or civic group in a worthwhile cause. Please call 804-270-6566 ext. 147 if you have any questions about the wish list or would like to donate items.